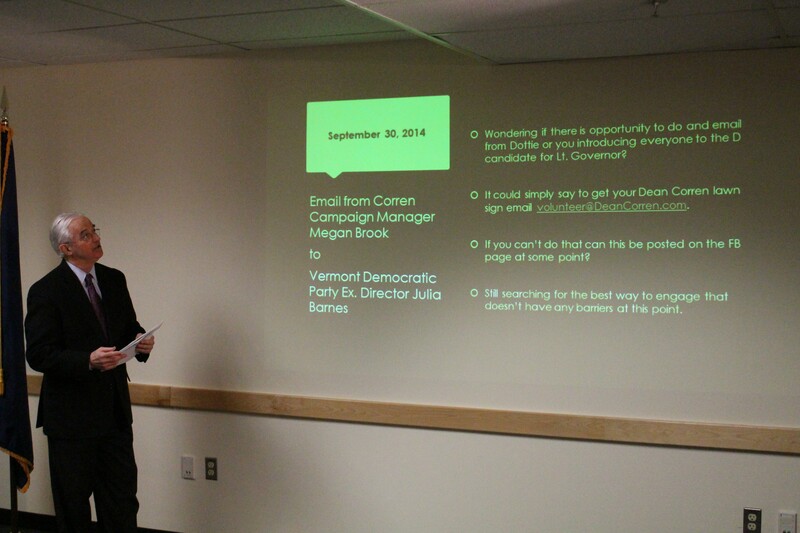 A $255 email may cost 2014 lieutenant gubernatorial candidate Dean Corren $72,000. Attorney General Bill Sorrell accused Corren Wednesday of violating Vermont's campaign finance law last October when his campaign asked the Vermont Democratic Party to send a mass email on his behalf. Because Corren had qualified for more than $180,000 in public financing earlier that year, the Progressive/Democrat was barred from soliciting further contributions. Sorrell alleged that the email, asking Democrats to support Corren and attend a campaign rally, amounted to an in-kind contribution. At a press conference Wednesday afternoon at his Montpelier office, Sorrell said he'd filed suit earlier that day in Vermont Superior Court seeking to force Corren to return the roughly $52,000 in public funds his campaign had yet to spend on October 24, the day the email was sent. The attorney general said he would seek an additional $20,000 in fines for the alleged violation and for Corren's failure to report the expenditure in disclosure filings. "Our legislature, in putting together this statute... said, 'Listen, if you're going to take the benefit, there are downsides: You have to play by the rules,'" Sorrell said. "And if you're not going to play by the rules, the penalties are significant." Through a lawyer, John Franco, Corren disputed the allegations. "This is really just a witch hunt by the attorney general," Franco said Wednesday. "Billy Sorrell wants to send Dean Corren to the gallows." Though the Vermont Democratic Party was also implicated in the matter, Sorrell said the party had agreed to settle and pay a $10,000 fine. In a statement, VDP executive director Julia Barnes said the allegations "involve claims where reasonable minds could differ." She said the party had agreed to settle in order to "avoid the cost of litigation and move forward." Corren, a Burlington resident and former state legislator, lost to Republican Lt. Gov. Phil Scott last November, 36 percent to 62 percent. As WCAX-TV first reported Tuesday, Corren filed suit in federal court last Friday seeking declaratory judgment that the email in question does not qualify as a contribution. He argued that costs associated with political party events featuring three or more candidates are exempt under the law. The email included the names of two other active candidates — Gov. 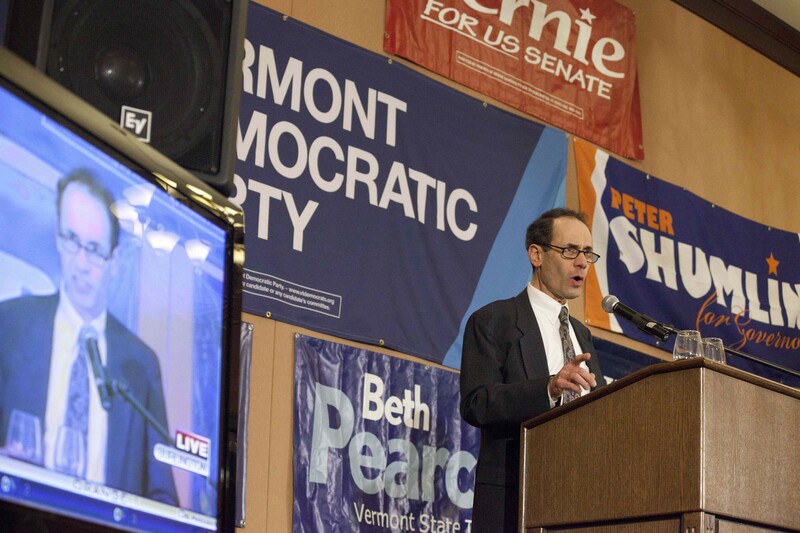 Peter Shumlin and Congressman Peter Welch — and the rallies it advertised featured many more candidates for statewide and legislative office. In his suit, Corren also claimed that aspects of Vermont's campaign finance law are unconstitutional. He said it unfairly restricts publicly financed candidates from associating with political parties, levies excessive fines and restricts access to the political process. Because Corren would have to refund the money and pay the fines out of his own pocket, Franco said, a judgment against the former candidate would "wipe out his retirement savings." During Wednesday's press conference, Sorrell argued that his enforcement action was necessary to clearly define the scope of Vermont's public financing law. Though it has been on the books for years, the legislature last year increased the amount of public assistance candidates for governor and lieutenant governor can receive. Candidates for lieutenant governor can qualify by raising at least $17,500 from at least 750 contributors who donate $50 or less. Corren cleared that hurdle last June by raising $19,283 from 862 people. That entitled him to $200,000 in public funds, minus what he'd already raised — or $180,717. In accepting that money, Corren signed an affidavit limiting himself to further contributions of just $50 per person. Sorrell's case appears to hinge on a series of emails sent by Corren's campaign manager, Megan Brook, and Barnes in September and October discussing whether the party would send an email in support of Corren to its list of roughly 19,000 supporters. In the emails, both Brook and Barnes acknowledge the potential legal hurdles and discuss how they might comply with the law. On October 24, the VDP sent such an email to its list in the name of party chair Dottie Deans, who had previously endorsed Corren. The email, based on one drafted by Brook, explained why Deans supported Corren. It specifically called on Democrats to attend a series of rallies in the closing days of the campaign featuring Corren and others, and it asked them to "commit to VOTE!" 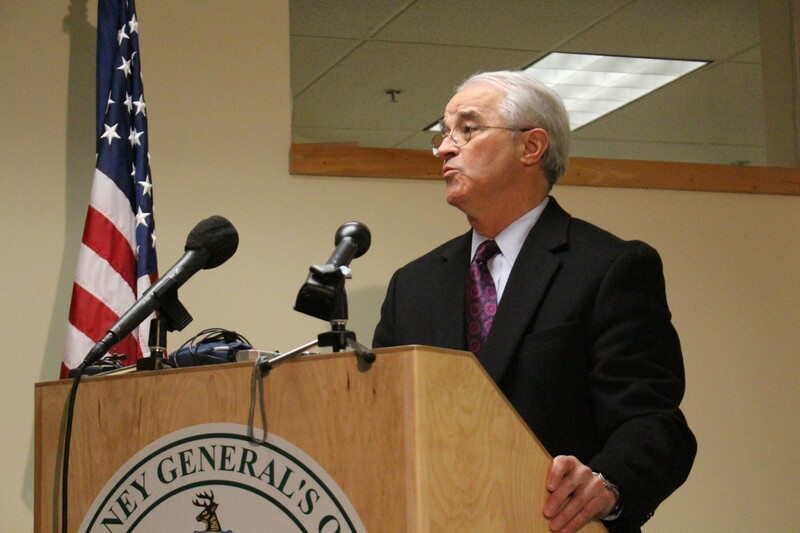 At Wednesday's press conference, Sorrell said, "It's clear that the Corren campaign solicited or requested this assistance and then, with suggesting wording that, in very large part, was adopted by the Democrats in the email to at least 16,000 Vermonters, that there was a solicitation of that effort by the Democrats." According to Sorrell's suit, the VDP valued the email at $255, though Sorrell said Wednesday that it could have been worth significantly more. Corren did not report the email as an in-kind contribution in his next disclosure report, nor did he immediately reimburse the party for the expense. According to Corren's suit, however, the candidate offered to pay the party $255 after Sorrell began investigating the matter. That offer was rebuffed. Asked Wednesday whether he investigated other candidates named in the email, Sorrell said he did not. He explained that the investigation was launched based upon a complaint filed by Ralph Colin, a Dorset man who has donated thousands of dollars to the Vermont Republican Party. Though the emails between Brook and Barnes — and one sent by Corren himself — appear to show all parties attempting to understand and comply with the law, Sorrell said he did not care whether or not they knew their actions were illegal. "I don't need to prove that," he said. As for whether the $72,000 penalty he's seeking was over the top and would have a chilling effect on public financing and Vermont elections more generally, Sorrell said he did not think so. "I didn't set the penalty," he said. "The legislature set the penalty."